3000 miles north & back: Grandpa Ron. I've been so fortunate and blessed to live the first 30 years of my life with all four of my grandparents by my side. Over the past year and especially the last couple of months, it became more apparent that my grandpa Ron's time to enter Heaven was coming. 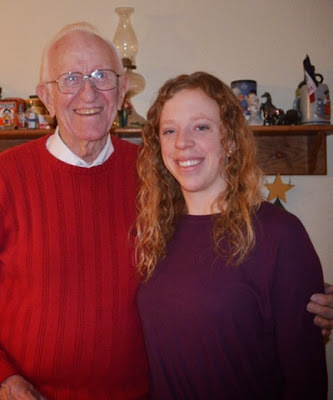 While it made every moment and every conversation with him more special and important, nothing really prepared me for when my dad called to tell me on Wednesday morning, February 11, that he had passed. Grandpa was a huge part of my life. He and my grandma were two of my biggest fans and supporters in everything I did growing up. I loved seeing my grandpa sitting in the crowd at basketball games from the time I was in about fourth grade. No matter how I played, I knew I was going to get a ginormous hug from him after the game. He was the best hug giver and loved his grandchildren so much. Grandpa taught me the importance of believing in and having faith in God. I find so much comfort in knowing he is in Heaven, in his best mental and physical state with no Parkinson's and really good knees, probably laughing, singing songs and dancing. He deserves to be mentally and physically strong again. That is who I will remember. Some of my most favorite memories of grandpa are fishing (he did all the gross stuff, which included pretty much everything except holding the rod), going for suburban rides and singing songs at the top of my lungs, eating ice cream (and stirring the ice cream until it became soup), playing cards (he was the best card shuffler), miniature golfing and so much more. I'll miss our conversations, his hugs and his smile...it was one of a kind. I find peace in knowing that I have an angel looking over me now and that when I get to Heaven, Grandpa will be waiting for me. I love you, Grandpa. Your presence will be greatly missed, but the impact you have had on my life will never be forgotten. Ever.